After mowing the vineyard yesterday, we had a very nice 1.13″ rain last night. The vines look very pleased today. Some have clearly entered the “grand period of growth” as they have exploded since last week. The Leon Millot is the most vigorous of the vines with shoots of 5 or more feet! 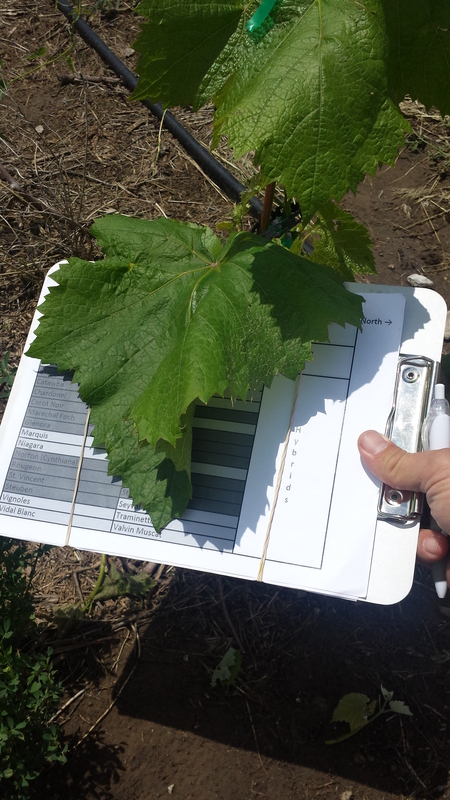 Last week I eluded to the problem with making observations after the training crew has been through the vineyard (i.e. all of the flowers were plucked). I beat the crew this week. Except for those slow starting varietals (or those that aren’t alive), nearly every varietal has blooming flowers. Those with leaves and no flowers observed today are Jupiter, Mars, Chardonnay, Lemberger, Glenora, Niagara, St. Croix, Stueben, and Valvin Muscat. There are eight varietals with less than half of their vines with leaves of the 12 planted last year. Not surprisingly, the vitis Vinifera are not faring well including Chardonnay (4), Lemberger (4), Cabernet Franc (0), Gruner Veltliner (1), and Riesling (3). The Zweigelt has exactly half of its vines with leaves (6, not exactly a success!). Hybrids not faring well are Neptune (2), Chardonel (6), Chambourcin (3), Noiret (7*), Traminette (1) and Vidal Blanc (1). I think the Chambourcin and Traminette are the biggest head-scratchers as they generally grow well in Kansas. In fact, the college 0.5 acres of both varieties in another vineyard just 6 miles north, and they’re doing quite well. 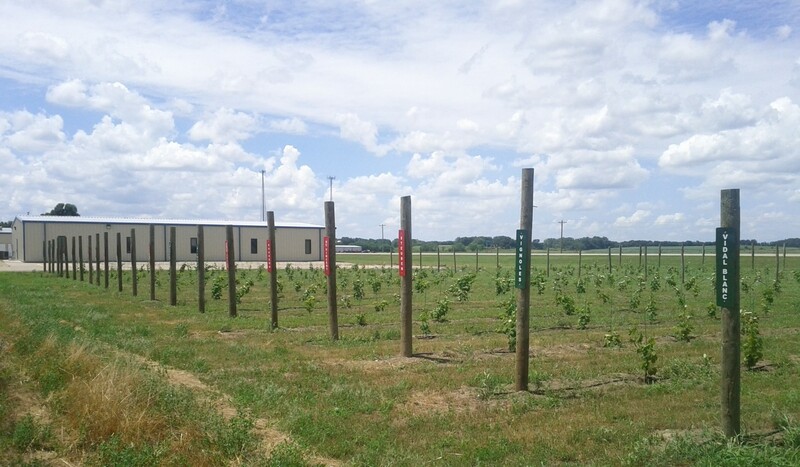 The asterisk from the Noiret denotes that 11 of the vines had leaves just a few weeks ago, but four of them have not yet recovered from the May 17 freeze event. Those four vines have brown, dead leaves with no green pushing as of today. While mowing vineyards yesterday, I noted in the Oregon Trail vineyard six miles north of Wamego that none of the 25 Cabernet Franc vines (planted in 2012) have not yet broken bud. Also, only half of the 5th year Chardonnay vines have leaves, and roughly one-third of the 5th year Riesling vines have no leaves. Indeed, it was a hard, cruel winter. Ending on a fun note, I’ve included a photo of a leaf from a Jupiter vine. There are other vines in the vineyard with large leaves like this one, but this is the first vine I observed today and was pleasantly surprised in the growth since last week. Enjoy!